Plaza de Mayo only occupies the equivalent of two city blocks, but there isn’t a more important public space in the city or even the nation. Site of the second foundation of Buenos Aires, Plaza de Mayo has witnessed cries for independence, civil strife, waves of immigration, Perón-inspired fervor & more than a few popular protests in recent years. There’s no better place to see the city’s past & present. But Plaza de Mayo does not reveal all its secrets at once. Important background information provides the proper context. After all, the first foundation of Buenos Aires was hardly a success. In order to survive, starving settlers packed up, moved north & founded Asunción. But their abandoned settlement would be reborn from its ashes four decades later in Plaza de Mayo. Learn why Spaniards failed in 1536 & why they returned again to the same location in 1580. The Spanish began to lose control of their South American territories when Buenos Aires broke away in 1810. Understand how & why this historic separation took place in the Cabildo (town hall) then spread throughout the entire continent. Nearby, the cathedral may have taken centuries to build, but the beautiful interior was worth the wait. Visit the mausoleum of independence hero José de San Martín, a miniature replica of the Papal altar & a chapel dedicated to Our Lady of Luján… with a unique memorial to Holocaust victims. Argentina’s first civic monument, the Pirámide de Mayo, takes center stage in Plaza de Mayo. Loaded with national symbolism, its significance is equally important to the Madres de Plaza de Mayo who risked their lives marching around the pirámide during the last military dictatorship. This guide also discusses the most impressive buildings on the plaza: the gargantuan Banco de la Nación & the Casa Rosada… even its bombing in 1955. This walk uncovers the first customs house (partially excavated), the original Congress building (hidden today) & brings to life the Recova Vieja (old marketplace) that was demolished in 1883. Opening in 2011, the Museo del Bicentenario takes visitors on a fascinating journey through Argentina’s past 200 years. But exhibits are only in Spanish, so we’ve mapped out the museum & explain the gorgeous Siqueiros mural on display. Original maps & artwork help visualize the plaza’s development over time. 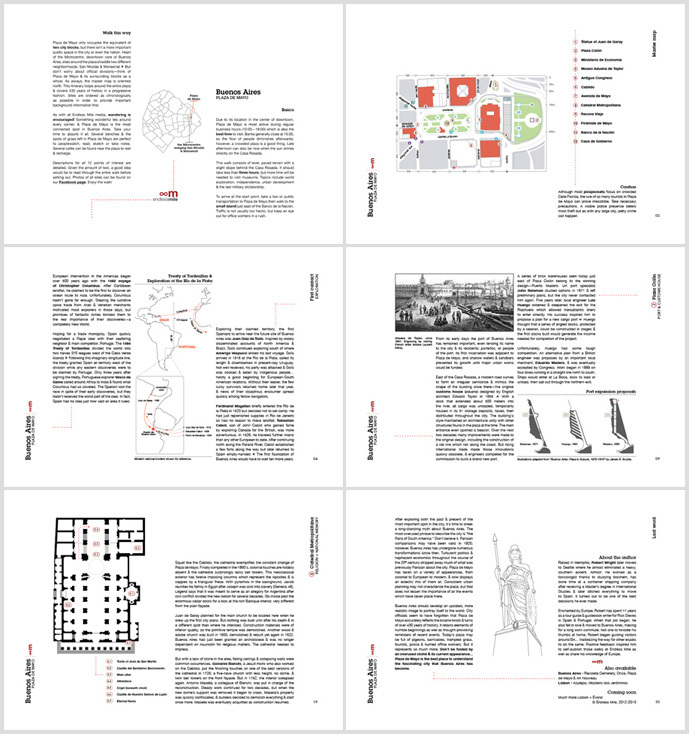 Format: PDF, A4 landscape, 32 pages. Ideal for viewing on any tablet or for print. Released Jan 2012, continuously updated. This guide may not be redistributed, resold or reprinted. Duration: The route takes about 3 hours to see everything at a leisurely pace. More time will be needed to visit museums. Several cafés can be found near the plaza to rest & recharge.